Harps with their beautiful sound and graceful aesthetic form have magically enticed man for many centuries. The Celtic harp also goes by the names folk harp, lever harp and Irish harp. 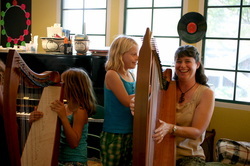 Ellen Beckerman will lead adult students into the world of the Celtic Harp using a method that she has devised based on her years of experience with the instrument.